You are Not Alone – A Carer’s Journey is written by carers for carers. As parents who care for children with a disability, we felt compelled to compile our thoughts, ideas and experiences to help other families navigate their way through what can only be described as the ‘maze’ of disability services. 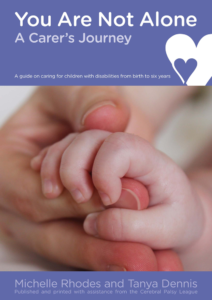 We have written You are Not Alone – A Carers Journey to provide guidance and advice to parents and carers centred on a child’s early years, from birth to six years of age. We hope that You are Not Alone – A Carers Journey will be a reference guide for you during your journey as a carer. We do not assume that you need all the information that this book contains, but we hope that you can select the information that is most helpful to you and your family. We hope that this book will help make your journey a little easier. Note: Information provided in this book regarding services, support and resources applies to the state of Queensland only. All rights reserved including translation into other languages. The Cerebral Palsy League of Queensland (CPL) has assisted with the publication of this book but is not otherwise associated with the book’s content. CPL takes no responsibility for the accuracy, currency, reliability and correctness of the content included in this book, which is the sole responsibility of the authors. CPL does not warrant or represent that the advice or information contained in this book is free from errors or omission. The content of this book does not necessarily reflect any policies, procedures, standard or guidelines of CPL. Any advice, information or opinions provided belongs to the authors alone and does not necessarily reflect the views of CPL. CPL is not liable or responsible to any person or entity for any errors contained in this book, or for any special, incidental, or consequential damage caused or alleged to be caused directly or indirectly by using, adopting or relying on the information or advice presented within. CPL has assisted with the publication of this book on the understanding it shall have no liability (including liability by reason of negligence) to the readers if this book for any loss, damage, cost or expense incurred or arising by reason of any person or entity using, adopting or relying on the information or advice, and whether caused by reason of any error, negligent act, omission or misrepresentation in the book or otherwise. If the readers have any concerns about the content or accuracy of the content of the book, they should raise it with the authors or obtain their own advice.